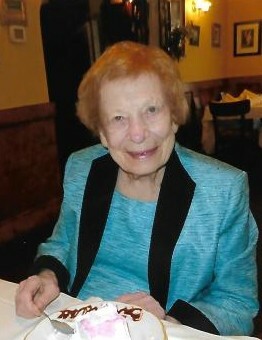 Obituary for Mary Kapec | Bayonne Memorial Home, Inc.
Mary Kapec, 100, passed away at her residence on Saturday, April 13, 2019, with her family at her bedside. Born in Bayonne on September 24, 1918 to the late Julia (nee: Cygler) and Anthony Kapec, she was a lifelong Bayonne resident. A 1936 graduate of Bayonne High School, she began her career at Western Electric and worked her entire professional career for the company in engineering. Mary loved to travel in her younger days and was a Master Bridge Player and avid Yankee fan; however, the center of her life was her family. She was predeceased by her beloved brother, Wesley A. Kapec. Mary is survived by her dear sister-in-law, Julie Kapec; her devoted niece, Janice Lo Re, and her husband, Vincent LoRe, Jr.; her loving grand nephew, Dr. Vincent LoRe, III, and his wife, Dr. Serena Cardill; and her cherished great grand nieces, Siena and Sophia LoRe. The funeral will be conducted from Bayonne Memorial Home, Inc. on Tuesday, April 16, 2019. A funeral Liturgy will be held at 12:30 p.m. at St. Nicholas Russian Orthodox Church, 606 Kennedy Blvd., Bayonne. Interment will follow at Evergreen Cemetery, Hillside. Visitation will be held on Tuesday morning from 10 a.m. to 12:00 p.m.